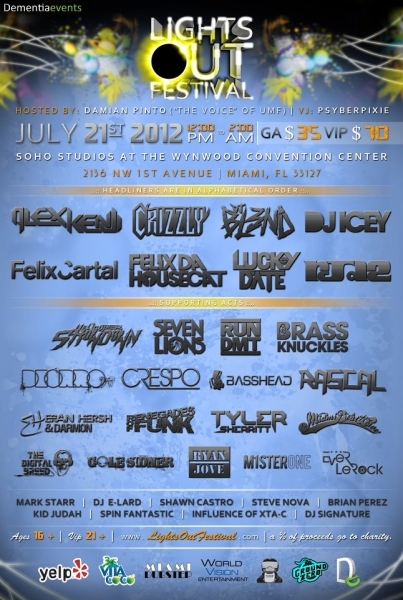 Lights Out Festival, a one-day audio-visual playground helmed by Dementia Events, debuts with a breakthrough roster of both established and up-and-coming electronic artists, set to bounce eclectic beats through Soho Studios at the Wynwood Convention Center on July 21, 2012, from noon to 2 a.m. Anticipating a mix of 30+ national and local acts, the announced performer lineup at the two-stage, indoor-outdoor venue includes: Felix Da Housecat; RJD2; Felix Cartal; Run DMT; DJ Icey; Lucky Date; Alex Kenji; Crizzly; DJ Blend; Brass Knuckles; Helicopter Showdown; Seven Lions; Crespo; Eran Hersh & Darmon; Tyler Sherritt; The Digital Breed and VJ Psyberpixie. In addition, the big Lights Out Festival debut will be hosted by none other than Damian Pinto, the official voice of UMF. A percentage of ticket sales will benefit local music programs and Miami-Dade County Public Schools. 3. The winner will be chosen on Wed July 18th at noon.